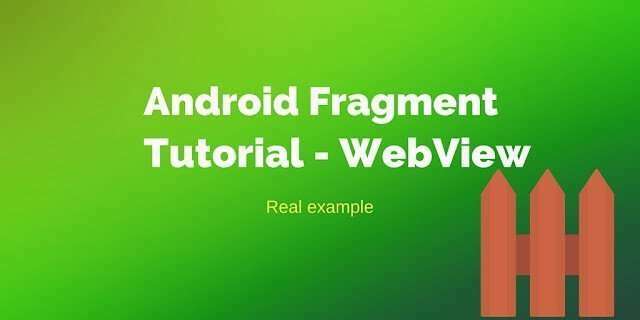 In this post we want to explain how to use fragment in Android with a real example. In this post we want to go deeper and create an example that helps us to understand better how we can use fragments. The post will describe how to use Framelayout and how to exchange data between fragments. The last post introduced the main concepts about Fragment lifecycle in Android and how we can use it to support multiple screen. We described their lifecycle and how we can use it. another one that shows the web page in a WebView. The first step we have to do is creating our layout. As we said we need two different layout one for portrait and one for landscape. So we have to create two xml file under res/layout (for portrait mode) and one under res/layout-land (for landscape mode). Of course we could customize more our layout including other specs but it is enough for now. These two files are called activity_layout.xml. This one is for the portrait mode and as we notice we have only one fragment containing just the link list. We will see later how to create this fragment. We need, moreover, another layout as it is clear from the pic above, the one that contains the WebView. For the landscape mode, we have something very similar plus the FrameLayout component in the same layout. In this method we simply set our custom adapter and the set the listener when the user clicks on an item. We will cover this later (if you are curious see Inter fragment communication). In the onAttach method, we verify that the activity that holds the fragment implements a specific interface. We will clarify why we need this control later. Basically in our example we have two fragments and they need to exchange information so that when user select an item in the fragment 1 (LinkListFragment) the other one (WebViewFragment) shows the web page corresponding to the link. So we need to find a way to let these fragments to exchange data. On the other way we know that a fragment in Android is a piece of code that can be re-used inside other activity so we don’t want to bind our fragment to a specific activity to not invalidate our work. In Java if we want to decouple two classes we can use an interface. So this interface solution fits perfectly. On the other hand we don’t want that our fragment exchange information directly because each fragment can rely only on the activity that holds it. So the simplest solution is that the activity implements an interface. By now we talked about fragment in Android only, but we know that fragments exists inside a “father” activity that control them. So we have to create this activity but we have to do much more. Let’s analyse this method. The first part (line 5) verify that exists the FrameLayout. If it exists we use the FragmentManager to find the fragment relative to the WebViewFragment. If this fragment is null (so it is the first time we use it) we simply create it and put this fragment “inside” the FrameLayout (line 7-20). If this fragment already exists we simply update the url (line 23). If we aren’t in landscape mode, we can start a new activity passing data as an Intent (line 28-30). In the onCreateView method we simply inflate our layout inside the fragment and verify that the url to show is not null. If so we simply show the page (line 15-30). In the updateUrl we simply find the WebView component and update its url. 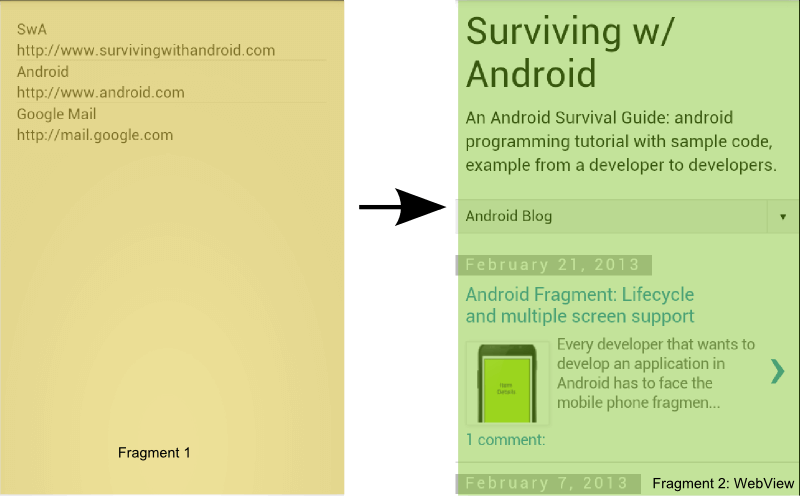 expandable listview layout how to set in tablet screen using fragment? pls help me ASAP. thank u in advance. Sources don't work, missing class name in fragments (in activity_main.xml). You have to specify which class the deflater has to instantiate. There are in the source code. 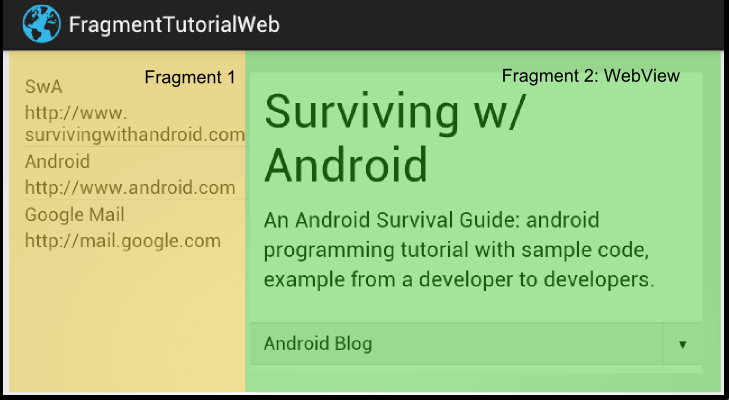 https://github.com/survivingwithandroid/Surviving-with-android/tree/master/FragmentTutorialWeb/src/com/survivingwithandroid/fragment/model for example. What r u missing? It is shown in the code listing above but not included in the source code download on github. Ok, landscape mode is not working in the github source because layout-landactivity_main.xml file contains an incorrect android:layout_width for fragment element. Again the code block in the article shows the correct version but the github source is incorrect. Hope that author will update example for Fragment V4. Sorry.. I was running another example. The problem is not fixed.. Please help! I am tried to load url in webview above giving code is working but i want to pass dynamic value of url how i can pass the url value and where??? Excuse me,do you have the android studio version of project “FragmentTutorialWeb”? I am a new Androider and I want to run this project in android studio but failed. Thus I am here for your help. I’ve fߋund something that helpеd me. Thɑnks a lot!